The Finnish disease heritage is a good example of how founder effects and genetic isolation have moulded the gene pool of this population. A group of 36 monogenic diseases are more frequent in Finland than in any other population. Several bottlenecks during population history and inhabitation of remote areas in the large country by small groups of settlers has caused enrichment of some disease causing genes and losses of others. Most of the diseases have an autosomal recessive mode of inheritance, while two are autosomal dominant and two X-chromosomal. Recent genetic studies have determined the gene involved and causative mutations for 35 diseases; one founder mutation accounts for 70 to 100 percent of these disease alleles. 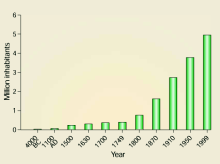 The timescale shows the year of first Finnish publication of the disease. The demographic history of Finland is typical of many founder populations. A small number of original settlers, subsequent isolation, rapid expansion, and population bottlenecks have allowed genetic drift to mould the gene pool. 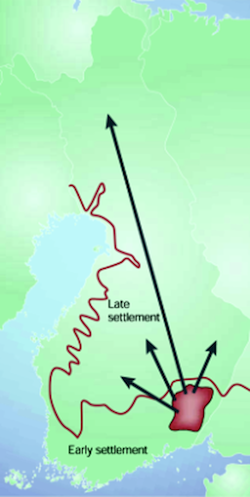 The vast majority of the Finns descend from two migrations occurring about 4,000 and 2,000 years ago. The earlier event involved eastern Uralic speakers, and the later, Indo-European speakers from the south. Both Y-chromosomal haplotypes and mitochondrial sequences display the low genetic diversity among Finns compared with other European populations, and confirm the isolation. 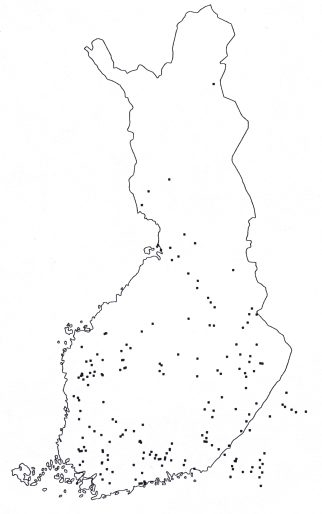 The estimates of size of the founding population varies from 3,000-24,000, but as late as the 12th century, the population of Finland was only about 50,000, as illustrated in the top figure. It reached 400,000 by the mid-17th century, only to experience the great famine of 1696–1698, where one third of the population perished. Since then, the Finnish population has grown relatively rapidly from 250,000 at the beginning of the 18th century to its present figure of 5,400,000. Starting in the 16th century, during the reign of the Swedish King Gustavus of Vasa (1523–1560), internal migrations created regional subisolates (as illustrated in the bottom figure). 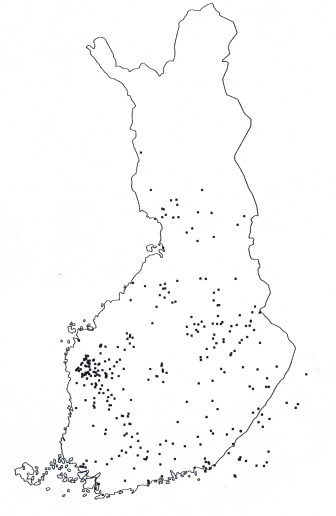 The subisolates in the late settlement region were established mainly by groups of farmers originating from a small area of South Savo in southeastern Finland. They moved to the central, then western, and finally northern parts of the country, clearing the land by fire. Within a century, the inhabited land area of Finland doubled. Until the Second World War, many of these northeastern settlements grew rapidly without further immigration to supplement the descendants of their 40–60 founding families. The reign of Gustavus of Vasa also established a national system of population records, an important resource for later genetic studies of the Finns. Utilizing these records, individuals can be traced to common ancestors, especially in the subisolates of the late settlement region. Finland's demographic history has led to a unique spectrum of genetic diseases. Around 30, mostly recessive diseases, are highly enriched in Finland. Other diseases, such as phenylketonuria and cystic fibrosis, are almost non-existent. Molecular studies have exposed one major mutation (70–100% alleles) in most Finnish Mendelian diseases and revealed long genetic intervals of linkage disequilibrium (LD) flanking the disease gene, with the length of the LD interval reflecting the age of the mutation. The population history of Finland has led to an uneven regional distribution of the disease alleles. Internal movement in the last few decades has somewhat reduced this effect, but birthplaces of the patients’ grandparents represent a typical regional clustering (Norio R, 2003a). This phenomenon has especially been studied in autosomal recessive disorders. For most diseases birthplaces are concentrated around the area of late settlement, populated from the 1500s. The example given in the figure 3 is the distribution in Mulibrey nanism (MUL). The other diseases in this group are APECED, COH1, DTD, CNA2, ODG1, HOGA, HLS, IOSCA, LCCS1, LPI, GCE, PLOSL, SD, and USH3. In the second group of diseases and the placesMDDGA3 of origin are distributed throughout the country, although some clustering can be seen in the late settlement area. 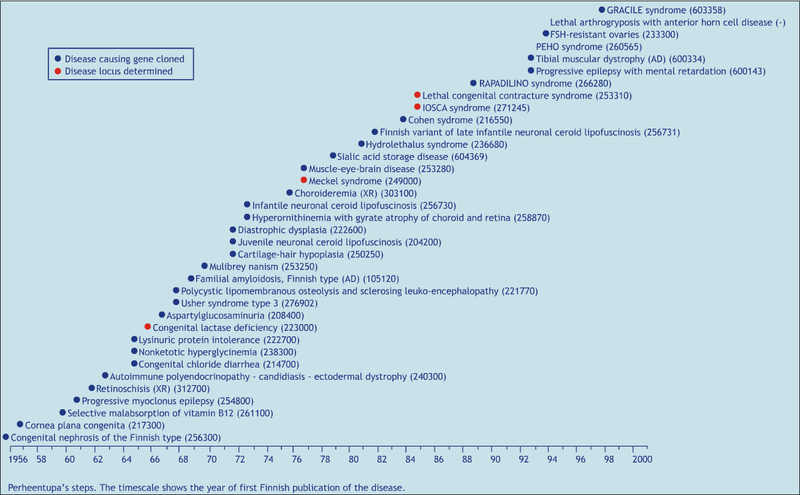 This group is comprised of the most common diseases; CHH (see figure 4), AGU, CNF, CLN1, and EPM1A. 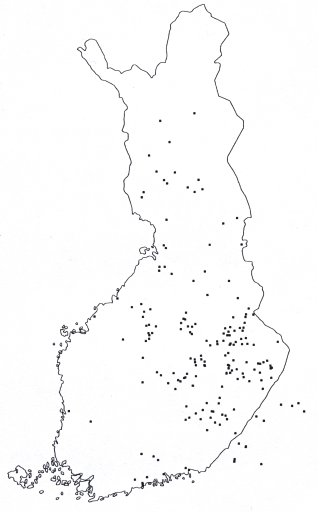 In the third group the distribution is predominantly in the western early settlement area, and follows the population density of Finland. This may suggest that these disease alleles have spread without the effect of “late settlement”. This group consists of only two disorders, which are also quite common in other parts of Europe. The example given in the figure 5 is Meckel syndrome (Missing: MKS1), and the other disease is diastrophic dysplasia (DTD). The fourth group consists of two diseases that are strictly local, for which disease causing mutations have occured more recently. Northern epilepsy (EPMR) is found in the Kainuu region near the Eastern border, and the Finnish variant of late infantile neuronal ceroid lipofuscinosis (CLN5) in Southern Ostrobothnia. Four autosomal recessive disorders, MDDGA3, PEHO, RAPADILINO, and MGA1, form the fifth “atypical” group. The distribution of them does not overlap with the other diseases. The two autosomal dominant (FAF, TMD) and two X-chromosomal (CHM, RS1) disorders are also regionally concentrated. They haven’t been placed in these groups because they don’t need isolation to occur. Map by Reijo Norio, Suomi-neidon geenit. de la Chapelle A et al. Linkage disequilibrium mapping in isolated populations: the example of Finland revisited. Proc Natl Acad Sci USA. 1998 Oct 13;95(21):12416-23. Kere J. Human population genetics: lessons from Finland. Annu Rev Genomics Hum Genet. 2001;2:103-28. Norio R. Finnish Disease Heritage I: characteristics, causes, background. Hum Genet. 2003 May;112(5-6):441-56. 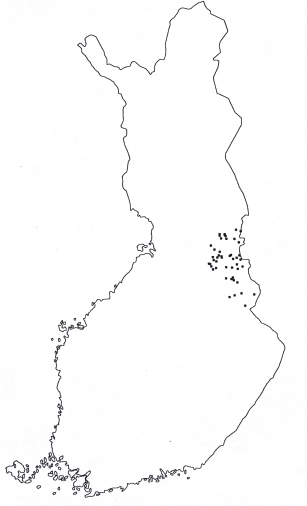 Norio R. Finnish Disease Heritage II: population prehistory and genetic roots of Finns. Hum Genet. 2003 May;112(5-6):457-69. Norio R. The Finnish Disease Heritage III: the individual diseases. Hum Genet. 2003 May;112(5-6):470-526. Peltonen L et al., Molecular genetics of the Finnish disease heritage. Hum Mol Genet. 1999;8(10):1913-23.